We have all felt the ache of abandonment at some point in our lives. Perhaps it was a physical and emotional abandonment: A partner who left abruptly, and seemingly without mercy. Suddenly you were made to live without that person’s love, and it was devastating. Perhaps you were emotionally abandoned by a sibling, who went from being your biggest protector to your biggest bully. Maybe it went on into adulthood. The person you had to protect yourself from the most ended up being a member of your own family. Or maybe your parents were emotionally and physically abandoned themselves, and they unknowingly did the same to you. They were trying to survive their pain, and in doing so provided you with empty offerings in lieu of what you truly needed: love and acceptance for who you were. Perhaps you were abandoned in ways you weren’t even aware of. Maybe your mother didn’t want to be pregnant – maybe she was angry about it – so for 9 + months, you felt perpetually unwanted and unloved. The aforementioned are all forms of abandonment, and they affect every aspect of our lives. Abandonment is not unlike a death. Someone you care about suddenly leaves you, either physically or emotionally, and the trauma surrounding the loss stays with you. It manifests in all sorts of troubling ways: Unrelenting self-loathing, the incessant pursuit of perfection, or an all-encompassing obsession with productivity and/or achievement are just a glimpse into the countless ways abandonment can shape our personalities. Addicts are born of abandonment. They seek pleasure as an alternative to the love they so desperately need. There are reasons why people don’t just get over their pain. There are reasons why someone doesn’t heal within a time frame society deems appropriate. Abandonment affects our brains. It can cause depression, anxiety, and PTSD. While it’s important to remember that for someone to abandon you they had to have been abandoned themselves, of more importance is the need to understand why you haven’t been able to heal. Understanding the repercussions of abandonment and how it affects us long-term is paramount to healing. I was introduced to the following book by my psychologist. After years of trying to figure out what was wrong with me on my own, I reached out for help. One appointment in and I realized I had many symptoms of abandonment PTSD. Two pages into this book I’m about to share with you, and I knew the work I had begun was going to bring about immense healing. And it has. This book has helped me understand that it’s not my fault I’ve struggled so badly with my mental health, which has been the most empowering aspect of my healing journey so far. While it’s directed at people who are going through a breakup, the philosophies and techniques cross over. There are life-changing insights offered in its pages and I implore you to pick up a copy and educate yourself on the repercussions of abandonment. I cannot recommend this book enough. Even if you don’t think it’s something you need to read, consider reading it for the people in your life who do. There are so many people walking this earth in pain, and they need our help to heal. If you’ve struggled with mental health issues your whole life, if you’ve buried yourself in addictions to avoid emotional pain, this is the book you need to read. It offers logical and practical steps towards healing. It teaches you how to value yourself again because, at one point, you did. 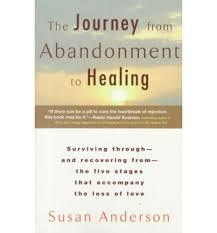 Check out The Journey from Abandonment to Healing, by Susan Anderson. If you have any questions, I’ll answer them as best I can. Email me: andrea@mustlovecrows.com. And if you’re vibing with what I’ve shared today, consider signing up to receive twice a month-ish emails from me. I share similar content and resources, plus access to my One Minute Meditation Guide. I send you love and strength as you continue on your journey to healing. You are loved.